Godrej has developed a mobile app to enable interested individuals and organizations to identify mangrove plant species. The app covers 24 mangrove and mangrove associate species found in Maharashtra. The users have the choice to identify species based on leaf shape, flower color and the name of the species. 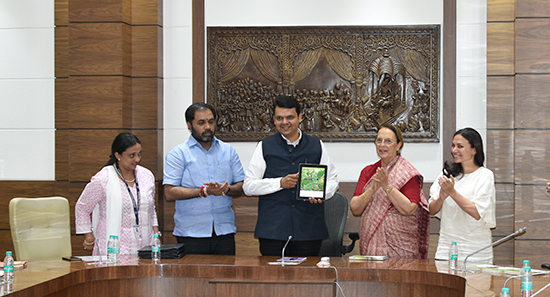 The app was launched by Mr. Devendra Fadnavis, Honorable Chief Minister, Maharashtra, with Dr. Mrs. Pheroza J Godrej and Ms. Nyrika Crishna Holkar on 12 July 2017. Dr. N. Vasudevan, CCF Mangrove Cell and Mr.Pravinsinh Pardeshi, Principal Secretary graced the occasion as well. In her speech, Mrs Godrej expressed the commitment of the Godrej Group towards the conservation of the Pirojshanagar mangroves. Mr. Fadnavis acknowledged the contribution of the Godrej family in the sustainable development of the nation. He appreciated the App's role in bringing information about the mangrove ecosystem to the citizens' finger tips.